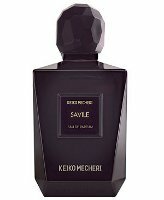 Niche line Keiko Mecheri has launched two new fragrances for men, Savile and Sedona Blue. Savile ~ "A dedication to masculine elegance, Savile deftly interprets the mythical fougere in chiaroscuro, reflecting the timeless chic-style and sophistication of bohemians artists haunting London’s Mayfair during the 1960s." With citrus, lavandin, orris, jasmine sambac, suede, Virginian tobacco, cedar wood, patchouli, amber and vanilla. Sedona Blue ~ "Inspired by the high desert in Arizona, Sedona Blue proves to be a delicate exercise in capturing the early hours of the arid yet fresh landscape. The even handed use of the natural elements are truly stunning and undeniably masculine." With citrus, aromatic, ozonic and woody notes. 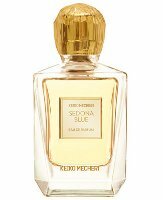 Keiko Mecheri Savile and Sedona Blue can be found now at Luckyscent, in 75 ml Eau de Parfum, $115 each. Savile gets more interest from me than Sedona. I like the idea of high desert, but ozone won’t probably work for me. Would certainly try them both though. Savile sounds nice. Will have to try it when it gets to Poland. Hope you won’t have to wait too long. I would like to take a sniff at Savile. Looks like Savile is the winner here!